Over the course of the past two months, I’ve found the Highlands Sleeping Bag to be as much an asset to my backpacking experience as it has been for my dog, Roland. No longer am I awoken at night to the sensation of being shoved out of my sleeping bag by a dog looking for a warm place to sleep. Roland seems warm and cozy curled up in the Highlands Bag at night, and enjoys having a soft place to rest at camp during the day. Deters your dog from climbing into your sleeping bag! At first glance, one might balk at the idea of toting a sleeping bag into the backcountry for a dog. Aren’t dogs designed to sleep in the wild? Perhaps so, but while technically I don’t need my extra cushy inflatable camping pillow, I’m a much happier camper when I have a soft place to rest my head. The same is true for my 5-year-old Vizsla, Roland. He’s capable of weathering an overnight in the absence of a sleeping bag, but is a much more enthusiastic (and well-rested) hiking companion when outfitted with the Highlands Sleeping Bag. 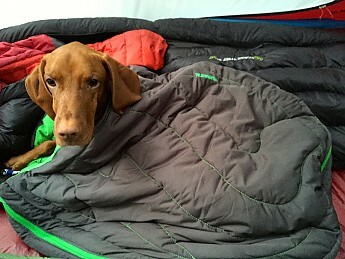 Along with Roland's assistance, I tested the Ruffwear Highlands Sleeping Bag as a member of the Trailspace Review Corps. Roland and I traveled in and around the White Mountains of New Hampshire from August through September of this year. The Highlands Sleeping Bag is a warm, durable sleeping bag for dogs. 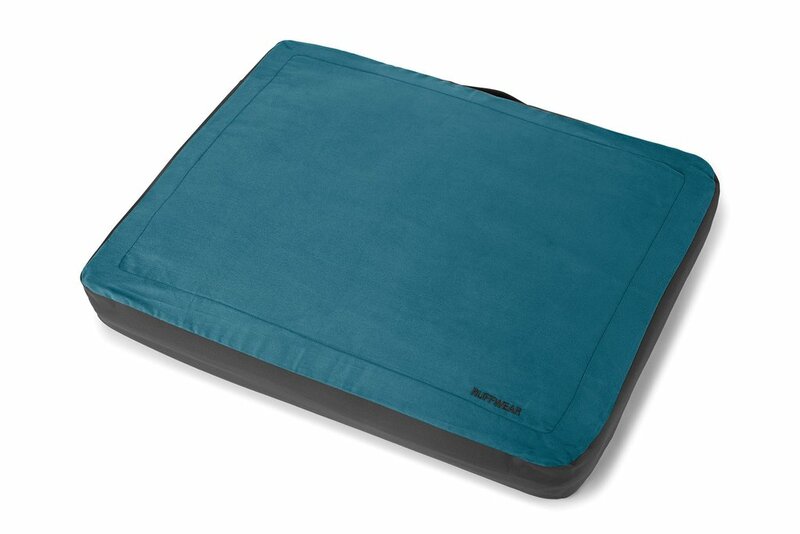 It can be used independently, or integrated into the Highlands Sleeping System, which includes the Landing Pad (which we also tested) and the Highlands Bed. Roland and I are, admittedly, fair weather backpackers with narrow comfort zones. I do most of my backpacking in the summer, which, even in northern New England, places limited demand upon a bag’s temperature rating. On humid summer nights, breathability can be of greater importance than warmth. Prior to testing the Highlands Sleeping Bag, Roland's backcountry bed consisted of an old closed cell foam sleeping pad that used to belong to me but has since been cut down to size. On cool overnights in the tent, my husband and I covered Roland with whatever gear we were not wearing ourselves. Roland and I don't venture out on winter overnights, so this system has worked well overall. That being said, when sleeping in a tent Roland tends to notify me that he is cold by stealthily climbing into my sleeping bag while I sleep! How do I know? Because the warmer he feels while snuggled up in my sleeping bag, the punchier he becomes. It is not uncommon for me to startle awake to the sensation of being in a boxing ring as I am pummeled by a 4-pawed competitor with ridiculously pointy toenails. My husband, Jim, lovingly refers to Roland in such instances as “fists of fury!” It’s hard enough to get a good night’s sleep on the trail without having to share, or fight for, one’s bag! 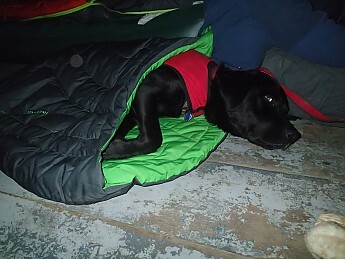 While Roland was testing the Highlands Sleeping Bag, the overnight temperatures were in the 50s and 60s (Fahrenheit). The Highlands Sleeping Bag is filled with synthetic insulation and isn’t temperature rated (let’s remember it’s designed for dogs after all). It keeps Roland warm and toasty overnight during our summer excursions. While I imagine the lower limit of the bag would vary greatly depending upon the dog, I probably wouldn't expect it to keep Roland warm overnight in temperatures lower than 40 degrees Fahrenheit without additional layers of insulation. This is largely because Roland is a shorthair dog. During our overnight trips this summer and fall, Roland didn’t show any signs of overheating in the Highlands, consistently remaining curled up in his sleeping bag until morning. The zipper on the bag allows for venting in that it could be unzipped partially to allow for improved breathability, or completely to act more like a blanket than a sleeping bag. Left: Roland in the Highlands Sleeping Bag, fully zipped. 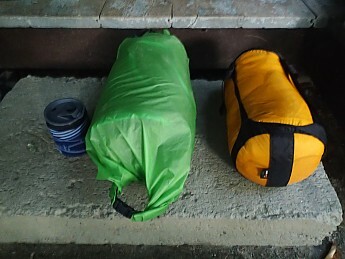 Right: Highlands Sleeping Bag half zipped. While I have no plans to test out the Highlands Sleeping Bag on an overnight in the winter (mostly because I myself have no interest in camping in the cold), I do hope to bring it on day trips into the backcountry this winter so that Roland can have a warm place to rest while I rest. It would be nice to take a break without causing my Vizsla to shiver in the snow! I’ll plan to post an update at that time if I have the opportunity to test it out. 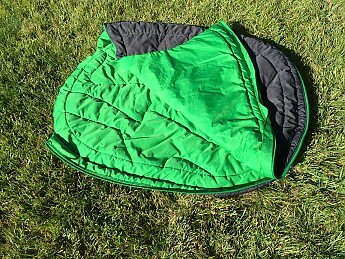 The Highlands Sleeping Bag measures 35 in x 26 in x 1 in when laid out flat. At 55 lbs, Roland fits perfectly in the Highlands Bag. Roland's topline measurement (length of his back) is about 23 inches, and his girth (distance around the widest part of his chest) is 30 inches. He has a little extra breathing room, which allows for some flexibility in positioning. At the same time, there isn't so much extra material that I regret having to bring the sleeping bag along in my pack. It’s important to note that the Highlands Bag comes in only one size, medium. Large dogs or dogs who prefer to really spread out while they sleep may feel more restricted. Below, I’ve included a photo of Casper, our large 10-year-old White Shepard, who is too old to accompany us on overnight trips, but has enjoyed using the Highlands Sleeping Bag as an indoor bed. Casper weighs at least 80 lbs (topline 29 in, girth 32 in) and generally uses a large or extra large dog bed. 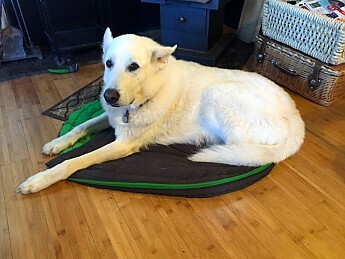 Note that the size of the Highlands Sleeping Bag works well as a dog bed for Casper, but would be too small for him to use as a sleeping bag—as if a dog with his coat would ever require extra warmth! This Highlands Sleeping Bag works well as a bed for Casper, but would not be a good fit if used as a sleeping bag. On initial inspection, I was concerned that it would be a challenge for Roland to position himself inside of a sleeping bag. However, it took only a couple of trial runs for Roland and I to get the hang of it. I unzip the bag nearly all the way and hold up the top portion while Roland lies down. Once he’s spun around a few times and settled in, I zip the bag up. While Roland hasn't figured out how to get into the sleeping bag without my assistance, he has no problem getting out on his own even when the bag is fully zipped (as you can see from the video below)! I will say that after a long day of hiking, Roland is far more likely settle into the sleeping bag for the night than he demonstrated on camera. The Highlands Sleeping Bag is constructed of a water resistant polyester shell, which keeps Roland high and dry. 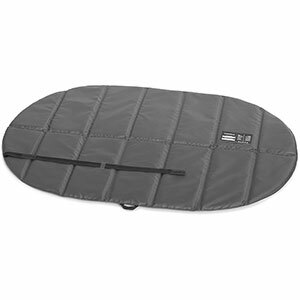 Using the Landing Pad adds an extra layer of protection from the elements. 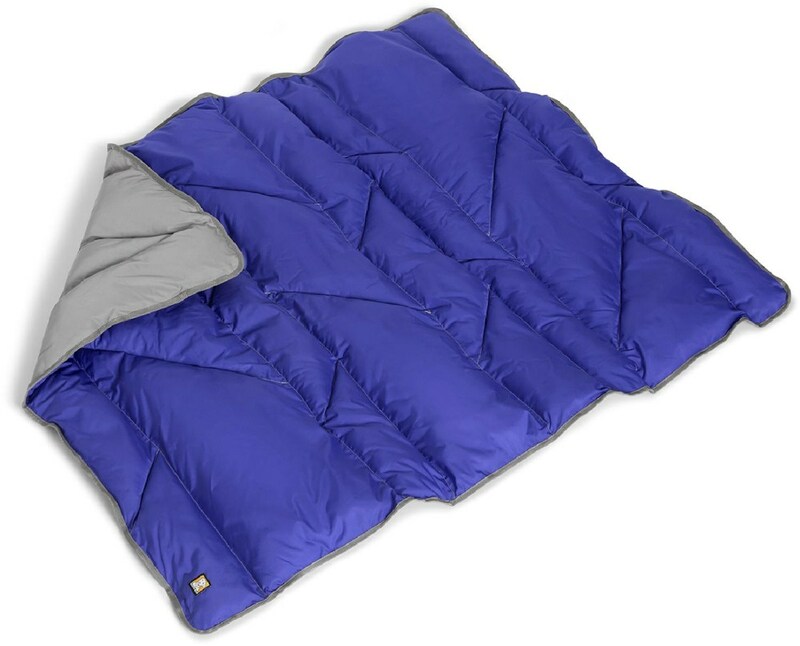 The Landing Pad fits seamlessly into a sleeve on the bottom of the Highlands Sleeping Bag and is secured in place with a simple Velcro closure. Left: Sleeve accommodating the Landing Pad. Right: Velcro closure. The water resistant shell is important not only when up against wet ground, but also wet dogs. During one of our adventures, we camped alongside a river. Roland, being the water dog that he is, enjoyed a post-hiking swim that evening. His coat hadn’t completely dried by the time we turned in for the night. The Highlands Sleeping Bag seemed to adequately repel water. He and the bag were both dry by morning. It is important to note that the bag is not waterproof. Roland, being a shorthair dog, tends to dry relatively quickly after a swim. However, if a dog with a really wet coat were to use the Highlands Sleeping Bag, I'd be concerned that the material would become saturated with water and lose its effectiveness. When compressed into its stuff sack, the Highlands Sleeping Bag measures 12 in x 7 in (according to Ruffwear and confirmed by my ruler). Ruffwear advertises that it weighs 1 lb 10.8 oz (I don’t own a scale with that level of accuracy, but that weight is consistent with my general impressions). 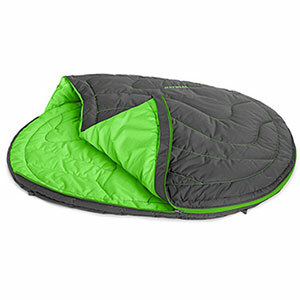 Ruffwear has designed the Highlands Sleeping Bag to fit into all sizes of the Ruffwear Palisades Pack. A comfortable, yet self-sufficient 4-legged hiking companion is a wonderful thing! However, as Roland doesn’t own the Palisades Pack I am unable to confirm whether or not it does in fact accommodate the Highlands Sleeping Bag. I was also unable to fit the sleeping bag into Roland’s existing OllyDog pack (which I believe has a total capacity of 7.5 liters, 3.75 liters on each side). On our first testing excursion, I attempted a creative strap system in an effort to force Roland to carry his own equipment. However, it ultimately proved insufficient. As Roland leapt and bounded down the trail, the precariousness of my jerry-rigged system became abundantly clear. Within the first quarter mile Roland was freed from his extra load and the Highlands Bag completed the rest of our journey strapped to the outside of my pack. Apparently my own leaps and bounds are, shall we say, less enthusiastic. While I appreciate that the folks at Ruffwear have designed the Highlands Sleeping Bag to fit into the pack they produce, it certainly came nowhere near able to fit in Roland’s existing pack. If you compare the dimensions of the bag when it is laid out flat to those when it’s compressed, you’ll see that the bag really doesn’t compress all that well. I’d love to see a more packable option. However, this might come at a cost, both financially and in terms of durability. Dog owners who intend to do a lot of backpacking with the Highlands Sleeping Bag may decide it’s worth investing in the Ruffwear Palisades Pack, or could simply commit to carrying the Highlands Sleeping Bag themselves. The Highlands Sleeping Bag is in the black stuff sack. Next to it in a green stuff sack is the Ruffwear Landing Pad. Here is where I feel the need to reiterate that this is a sleeping bag for dogs. The loft is comparable to that of a standard comforter, about 1 inch in depth when laid out flat. It certainly doesn’t compare to my own 800-fill sleeping bag. There may be people out there who are willing to put down the extra cash that I’m sure would be demanded for a product with higher loft. Don’t tell Roland, but I’m not one of them. 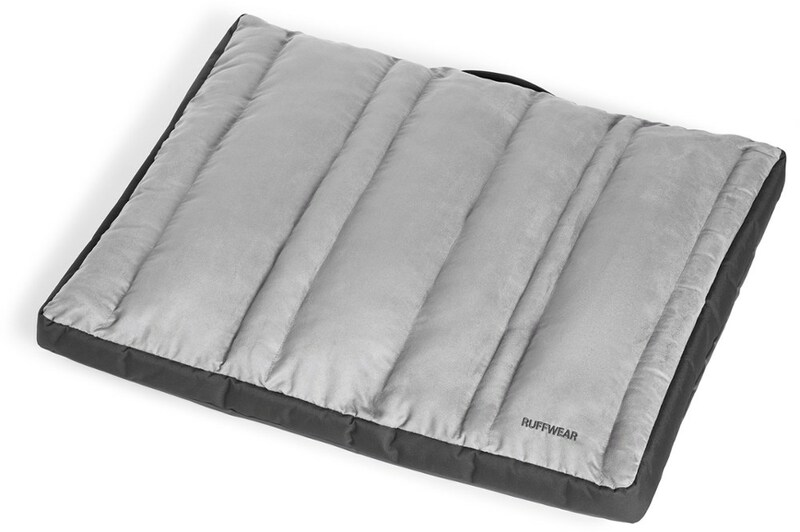 I would suggest using the Ruffwear Landing Pad along with the Highlands Sleeping Bag if your dog is in need of some extra cushion and/or insulation. 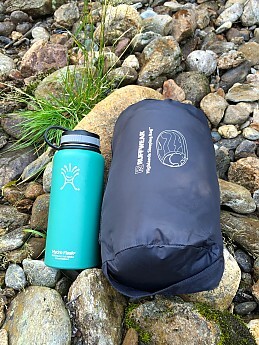 The Highlands Sleeping Bag is simple and straightforward. One can tell that Ruffwear focused upon creating a reliable product that is both canine- and human-friendly. The large metal zipper is easy to locate and thanks to a durable liner, zips and unzips easily without catching on material around its edge. The liner also prevents the zipper from accidentally attaching to the dog’s coat. Roland snuggled in the Highlands Sleeping Bag with the zipper lining visible at the top opening of the bag (light green in color). I also appreciate the fact that the zipper doesn’t detach when the bag is fully unzipped. When it comes time to transition from dog bed to sleeping bag, there is no need to fumble around trying to put the zipper back together while your impatient pooch looks on, openly mocking your lack of zipper prowess. While Roland is zipped into the sleeping bag at night, he enjoys using the Highland Sleeping Bag as a bed during the day. He certainly doesn’t need the extra space, but the Highlands Bag can be laid out flat when unzipped completely, essentially doubling the real estate. 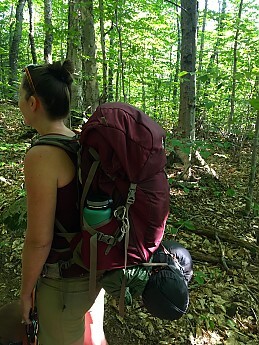 It’s nice to have all three options wrapped up into one product, minimizing the amount of gear you (or your dog) is required to schlep along on an overnight excursion. 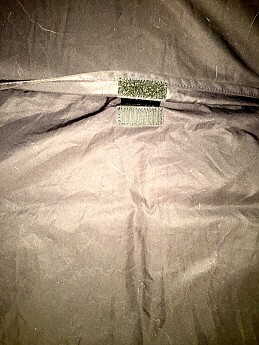 Highlands Sleeping Bag zipped (left) and unzipped (right). The Highlands Sleeping Bag includes four stake-out loops, which can be used to secure the bed to the ground (you'd have to supply your own stakes). The loops could also come in handy should you need to hang the bag to allow it to dry. I haven’t found the need to use the stake-out loops as Roland sleeps in the tent with me when we’re camping. However, it’s a nice feature to have just the same. The loops are hidden away in the sleeve located on the bottom of the bag. When needed, they can be pulled out through reinforced holes in the sleeve. I love this system, as the loops remain protected when not in use, with no risk of catching on sticks or other debris that could cause unnecessary wear and tear. While Roland is a shorthair dog, his coat is comprised of wiry, rust-colored needles of hair that tend to latch themselves on to most fabric. For example, his presence is prominently displayed across the black interior of my car despite my failed attempts at Roland-specific vacuums and seat liners. In contrast, the polyester shell of the Highlands Sleeping Bag sheds dog hair and dirt with just a shake. The outer dark gray color is also a bonus as it disguises the inevitable scrapes and stains that seem to come along with canine outdoor adventures. The bag is also machine washable, which is a huge bonus for dog-specific gear. Honestly, after two months of use the Highlands Sleeping Bag had yet to require washing. Roland had really done a lot of rolling around on the Highlands Bag, and it still passed the smell test. That being said, Roland tends to escape some of the odor issues to which his long-haired counterparts can be prone (such as the wet dog smell). I did run it through the machine just to see how it would fare. It now looks and smells as good as new and shows no signs of washing machine damage. The material and stitching have sustained exposure to the elements without any obvious signs of wear. More impressively, repeated assault by Roland and his pointy toenails has resulted neither in scuffing, tearing of material, nor ripping of seams. Over two months of testing, Roland has used the Highlands Sleeping Bag on overnight excursions in the mountains throughout the summer months. In between trips, he also uses it as a bed indoors or out in the yard when Jim and I are gardening or gathered around a campfire. We travel to and from the trail in a pickup truck with a cap. Recently, we’ve begun tossing the Highlands Sleeping Bag in the back of the truck with Roland to give him a little extra comfort pre and post hike. He’s voiced no complaints! The Highlands Sleeping Bag retails for approximately $100. My initial reaction was that this seemed a bit high. Digging around on the internet I was able to find only a few other canine sleeping bags on the market, and haven't had direct experience with any of them. I was surprised to see that the Highlands Sleeping Bag is somewhere in the middle in terms of price point. I found a couple of significantly less expensive options (around $30-$50), which listed very limited information regarding specific features. I also found a product that was nearly $200. It seems essentially equal to the Highlands in terms of size, packability, and weight. However, it includes some additional features, such as a waterproof shell, and the ability to double as a bed with raised sides. I also read of some dog owners investing in a two-person sleeping bag to share with their pet. I say go with whatever floats your boat (and your bank account). Lightweight, durable, and easy to use and keep clean, the Highlands Sleeping Bag has become a staple of Roland’s backcountry and front-country adventures. It has performed well in environments ranging from backyard evening retreats to overnight backpacking excursions. Only one size is available, which may be a limiting factor for large breeds. Additionally, packability should be considered when planning overnight trips. The financial investment is also a factor to consider. 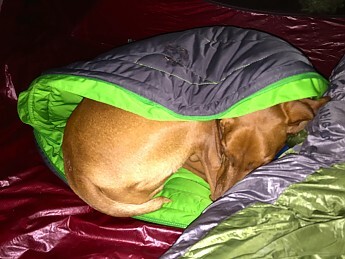 I’d recommend the Highlands Sleeping Bag to any dog owner plagued by sleepless nights in the backcountry. You know who you are, roused from sleep by canine companions who insist upon sharing or altogether usurping your sleeping bag. To you I say, invest in the Highlands! Take back your sleeping bag! Thanks to Ruffwear and Trailspace for introducing Roland to gear-testing! Also, thanks to Jim for his videography and photography skills (including this shot of Roland and I nestled in our sleeping bags...yes, I'm in there somewhere)! Great review, Kelly! My lab, Brice, always sneaks into my tent and naps on my sleeping bag/pad (which is NOT ok because of his claws). I'd love for him to have his own bag/bed! Hopefully they will make a large or xl size in the future that would fit him. These are super helpful reviews, Kelly and Roland! 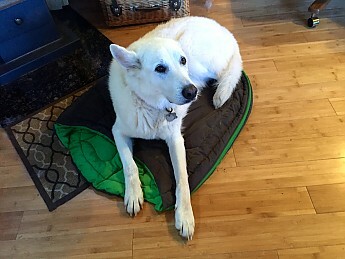 Thanks so much for testing out and explaining the Highlands Sleeping Bag and Landing Pad for others (I don't even have a dog and I was curious to see how it worked). I also love all the pics (thanks, Jim!). EXCELLENT review! We just received the bag and pad from backcountryk9.com to review, and we use it primarily for canoe camping....up until now, we have used a youth size sleeping bag for each of the dogs...we've only been out once with the Highlands, but it will get a few more tests in the next few weeks, when temps will get down into the 30's. Thanks everyone for your comments! Sheila, I'd love to hear how the Highlands works out for you. Source: Product provided to me while I was an ambassador for Backcountry K9. That site no longer sells gear, and I am no longer an ambassador. 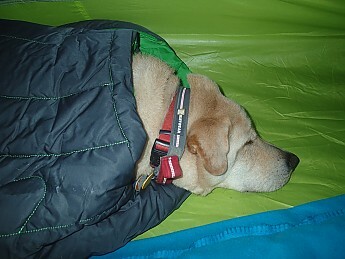 (Disclosure: This sleeping bag system for dogs was provided to me while I was an ambassador for Backcountry K9. That blog site no longer sells gear, and I am no longer an ambassador.) Do check out the backcountryk9 blog for informative articles and reviews! Recently, Hurrta has joined Alcott and Ruffwear as dog gear manufacturers offering dog-specific sleeping bags. We really like this Ruffwear bag, though it is a bit small for our larger dogs. We have used it for two full camping seasons. This review is for the bag and the separately purchased pad. We can recommend this system, if you, like us, provide your dogs with top-notch gear. We are in the process of planning a big cross-country trip for paddling season, and inventorying all our gear, to decide what we need to replace, upgrade, or change. In this process, we are looking at our dogs' gear, especially in terms of sleeping equipment for them. 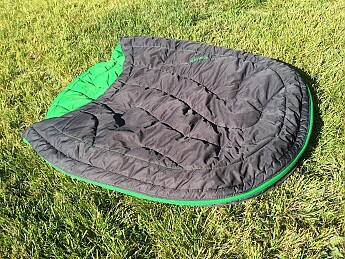 One of our items is the Ruffwear Highlands Sleeping Bag and Pad...so here we offer our review of this item. Our dogs camp with us, usually in a tent, sometimes in leant-tos, on an almost weekly basis, May through October. 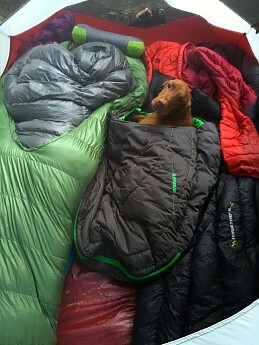 We have never wanted the dogs sharing our own sleeping bags, but we need to be sure they are warm and comfortable. 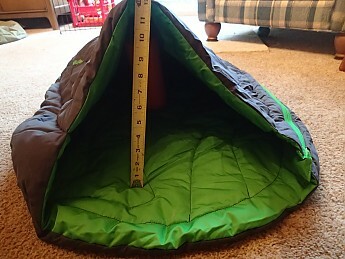 Traditionally, we have used kid’s sleeping bags, which leave about two feet of unused space at bottom, but do provide good “over” coverage for the dogs, as when they are unzipped, they provide a good area for sleeping on, with extra material to fold over the dogs (unzipped, of course); they also pack up small in compression sacks. But such bags, while warm and readily obtainable, are not really shaped for a sleeping dog, especially one that curls up, like ours do. So we were pleasantly surprised when Ruffwear introduced a sleeping bag system designed specifically for outdoor dogs. Backcountryk9.com provided this gear for us to test at the end of camping season, which was a good situation, since the nights certainly get cooler then. I first examined the bag, and gave it a trial fitting in the house. This sleeping bag for dogs is extremely well made, with strong zippers, a stuff sack which attaches to the bag with a plastic clip when the bag is in use, good insulation ,and a contoured shape for the dog. 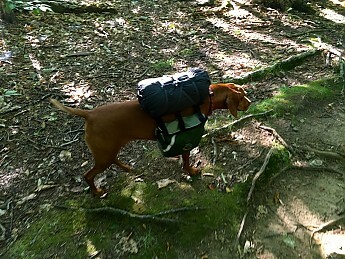 We then gave the bag a test on multiple different camping and canoe camping trips, and actually let both of our dogs give it a try. Temperatures ranged from 30 to 48 degrees on these nights, we were in a tent or lean-to, and neither dog ever seemed to get cold in the bag. 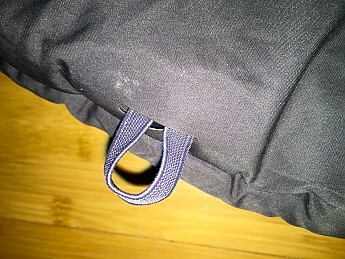 The bag zips open, to provide a nice flat sleeping layer, with synthetic insulation. Our dog seemed to prefer this mode, rather than being zipped up into the bag. Usually, our dogs sleep uncovered, and then if it gets cold, we flip up a flat part of the sleeping bag to go over their torsos. Gryphon is a 72 lb., yellow lab mutt, and he is a bit big for the bag. The bag is offered in only medium size, which is probably more suited for a smaller dog. Our 55 lb. black lab mutt Edgar was a better fit, but even he seemed a bit long for the medium bag. There is only a one-way zip on the bag, and when our dogs were zipped into the bag they had a bit of a difficult time trying to stretch out or turn around. The bag is 35 in x 26 in, with 1 in loft, and when zipped and flat, the available “height” of the bag is 12 inches. That makes it a bit snug for Gryphon, who has a curled up sleeping “height” of 10-11 inches, when he is zipped into the bag. Even with their back ends at the base of the bag, their shoulders and head seemed to hang out of the front of the bag, off the insulated and padded material. This was fine in the temperatures we were using it, but if it is much colder, we like to have our dogs’ bodies covered and this size bag just would not be suitable for that. For us, it makes a great portable, easily packed bed for camping, with a nice insulated layer under one portion. 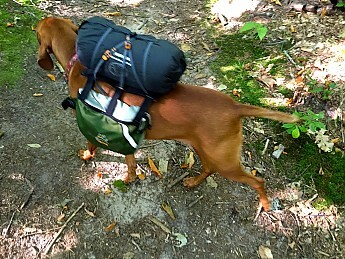 The bag itself is clever, well made, and does meet a need for dogs that spend time camping or backpacking. It seems durable, and meets washability requirements for dog and camping gear. When placed in the included stuff sack, the bag is approx. 12 x 7 inches. The weight of the bag is 1 lb. 11 oz. 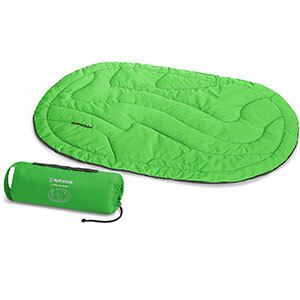 This size makes it suitable for camping and backpacking if you have the room and need for it. If you utilize the Ruffwear Landing Pad (review to follow), it will not fit into the stuff sack when the pad is inserted into the bag. The bag, and pad, are each designed to fit into the compartments on the Ruffwear Palisades pack, hence the offering in the one medium size. We have used a compression stuff sack (not compressed) to pack up the bag with the pad inserted, as a unit. 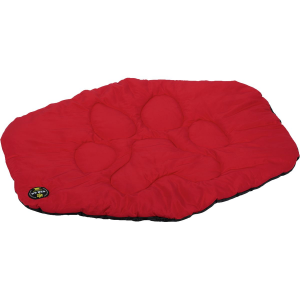 The Ruffwear Landing/Highlands Pad is an accessory that is sold separately ($29.95). 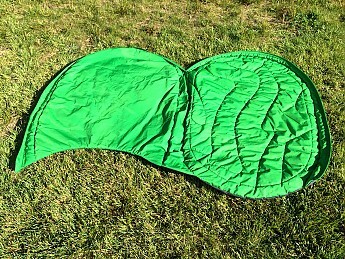 It is oval shaped, 34 x 25 inches, and provides an extra insulating and padding layer for the Highlands Sleeping Bag (it slides into a sleeve on the base of the sleeping bag), or as a stand-alone pad. We found out dogs liked to rest on this pad (though it is also a bit small, as it is sized for the medium bag), and admittedly, we also used it as a comfort pad for us when sitting on a rocky shoreline. 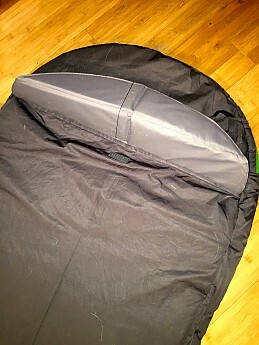 When using the Landing Pad inserted into the sleeping bag, we found the sleeping bag seemed to stay in position better…the bottom of the bag remained flat, while the top was able to be adjusted and unzipped/zipped as necessary for coverage of the dog. The pad folds up accordion style, with an attached Velcro strap that holds it snugly in a compact mode. Though I found the pad a bit thin (.4 inches), it does seem to provide padding and insulation, useful when we are camping on less than smooth sites, or on cooler surfaces. Our dogs love camping with us, and get all excited when they see the gear getting collected and packed. We are responsible for them in the woods, on the trails, or on the water…so if there is gear that can make the trip more enjoyable for them, we will seek it out. 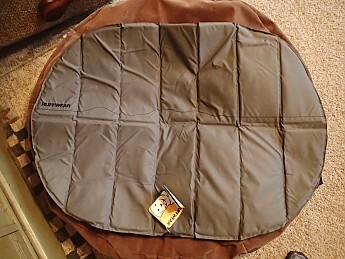 The Ruffwear Highlands Sleeping Bag and the Ruffwear Landing Pad may seem a bit pricey, but if your small-medium size dog loves camping with you, the sleeping system provides a secure, snug, warm, and durable sleeping option. I hope that Ruffwear considers offering this bag in a larger size, so more dogs can take advantage of its nice design. Nice review, Sheila! Thanks! I hope Ruffwear offers this bag in more sizes for more outdoor dogs.